Nineteen-year-old Alex Bolt won his first Pro Tour title on Sunday at the 2012 City of Onkaparinga International in Happy Valley, South Australia. After losing the first set, eighth-seeded Bolt fought back to defeat sixth seed and 2006 champion Adam Feeney (Gosford, NSW) 5-7 6-3 6-1 in front of a home crowd. It’s the second time Bolt has defeated 27-year-old Feeney, the last time being in Cairns three weeks ago. “It’s a great feeling being in your home town, at a home tournament and winning,” Bolt said after the match. “I stayed at home all week, which was nice. A little bit more relaxed than usual. “Each match I went about it the same way and I guess my draw did open up a little bit. I was lucky enough to come away with the goods,” Bolt continued. The match was Bolt’s first ITF Pro Circuit final having only reached the semifinals of a Futures event twice before. The championship win adds to Bolt’s breakthrough season, which has seen him claim three ITF doubles titles already this year. On Saturday Feeney came back from 3-5 0-40 down in the second set to oust junior Grand Slam champion Luke Saville (Barmera, SA) 3-6 7-5 6-3 in the semifinals. Saville, however, stepped up in the doubles to win the title with partner Andrew Whittington (Williamstown, Vic) over Japanese duo Yuichi Ito and Yusuke Watanuki 6-3 6-2. Both Saville and Whittington, alongside Bolt are members of the AIS Pro Tour Program. Up north, top seed Chanel Simmonds from South Africa won the inaugural City of Salisbury Tennis International after she comfortably defeated second seed Zuzana Zlochova from Slovakia 6-3 6-0. The world No.193 lost just nine games throughout the tournament to win her first ITF title for 2012 and her tenth in her career to date. Zlochova also cruised through the draw before being pushed to three sets by Victoria’s Sally Peers (Glen Waverley, Vic) in the semis. 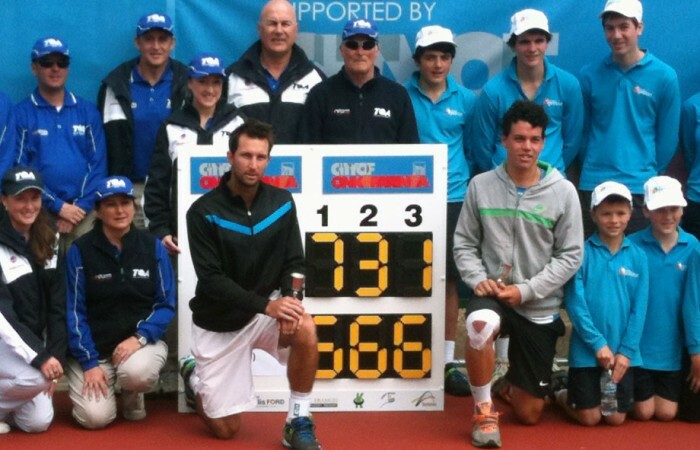 The Australian Pro Tour continues its tour of South Australia this week at the Nyrstar Port Pirie Tennis International (15–23 September 2012).